STAFFORD SPRINGS, CT – It’s official, the 2018 NASCAR Whelen All-American Series season at Stafford Motor Speedway has entered into the record books. Ronnie Williams, Tom Fearn, Marcello Rufrano, Jeremy Lavoie, and George Bessette, Jr. secured the track championships but the 2018 season offered fans more than just championship battles. NAPA Auto Parts, in their 5th year of elite partnership with Stafford Speedway, presented the biggest events of the year at the Connecticut half-mile facility, the prestigious 47th Annual NAPA Spring Sizzler in April and season ending NAPA Fall Final in September. For the second straight year, Ryan Preece drove the No. 6 TS Haulers Chevrolet to Victory Lane at the NAPA Auto Parts Spring Sizzler. Preece was the first driver to win the Sizzler in back-to-back years since Bobby Santos III in 2013-14. NASCAR Hall of Famer and vintage racing enthusiast, Ray Evernham, served as the Grand Marshal for the 47th running of the NAPA Spring Sizzler. Evernham also brought three fully restored vintage Modifieds for the Vintage All-Star event and competed in the #99 Bodine modified. In the 46th Annual NAPA Fall Final, Kyle Bonsignore took the lead from Doug Coby with just five laps remaining and went on to capture his first checkered flag in Whelen Modified Tour competition. While Kyle Bonsignore celebrated his first career NASCAR Whelen Modified Tour win, another member of the Bonsignore family, his cousin Justin, celebrated as he clinched his first championship. The Gagner Family from Wild Thing Kart Series served as Grand Marshals of the NAPA Fall Final. A popular addition to the Fall Final was the Inaugural Ladies Challenge, an 8 lap Street Stock shoot-out. Women associated with Stafford race teams were paired with Street Stock teams and raised an amazing $35,000 for various foundations and charities. The NAPA SK 5K in its 5th year of existence offered a purse of over $27,000 with the winner guaranteed $5K. In NAPA Victory Lane the race winner, Ronnie Williams, pulled the winner take all chip in the Dunleavy’s Gambler Challenge, boosting his NAPA SK 5K payday total to $10,625. The SK Lights took center stage on May 25 for the Dunleavy’s Modifiedz Night in a 40-lap feature that paid over $10,000 in total posted awards. Thanks to Doug Dunleavy, the winners of the SK Modified® Late Model, Limited Late Model, and Street Stock feature events doubled their winnings. Also providing bonus money was John and Maina Rufrano from Wheelers Auto Service with the second and third place finishers in the SK Modified® and Late Model feature events taking home an extra $200 while the second, third, fourth, and fifth place finishers in the SK Light, Limited Late Model, and Street Stock features each received a $100 bonus. The big winners of the night included Marcello Rufrano in the 40-lap SK Light feature, Rowan Pennink in the SK Modified® , Tom Fearn in the Late Model, Jeremy Lavoie in the Limited Late Model, and Johnny Walker in the Street Stock feature. For the first time since the late 1970’s, non-sanctioned open modified races were included in the 2018 schedule. The two events both followed the traditional “Sizzler” distance of 80 laps, paid $3,500 to win and $660 to start. Both events were held in conjunction with Stafford’s 5 weekly racing divisions. The Twisted Tea Open Modified 80 on June 8 took center stage for an 80-lap race and Tommy Barrett, Jr. used an early pit stop to gain track position when the majority of the cars came to pit road at the halfway point of the race. He led 38 of the final 40 laps to win the Twisted Tea Open Modified 80. Then on July 13 an enthusiastic Eric Goodale used a great pit stop to climb from seventh to second after a round of pit stops and he led the final 41 laps to win the Bud Light Open Modified 80. 2018 brought the rebranding of the DARE Stock division to the Street Stock division. The car counts increased and featured exciting competition. The laps increased from 15 to 20 along with 2 extra distance events. The Casagrande Builders Street Stock 25 in May was won by Mike Hopkins and the R.A.D. Auto Machine Street Stock 30 by George Bessette, Jr. Ten different winners reached NAPA Victory Lane. First career winners included Rookie of the year Meghan Fuller, Tess Beyer and Jason Lafayette winning the Gaston Racing event in July. Friday, July 13th was a special night with the Inaugural running of the TC 13 SK Modified® Shootout in honor of the late Ted Christopher. The special shootout event was held directly following the scheduled 40 lap SK Modified® feature with the top-13 finishers earning entry into the shootout. The top-13 were inverted and the 13-lap shootout was run with Glen Reen taking home the first place winnings of $1,313. The total posted awards for the TC 13 Shootout was $7,319 thanks to the generosity of sponsorship partners. 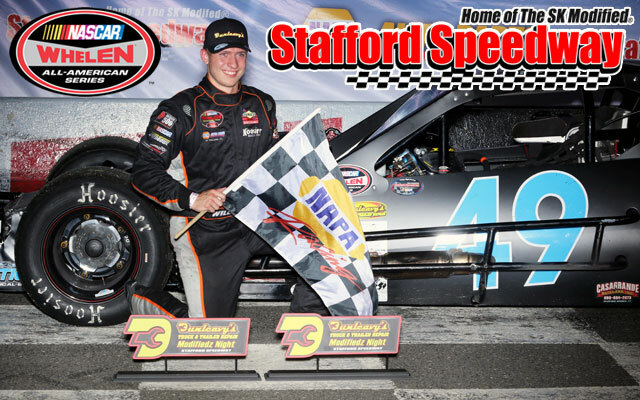 In the Starrett 150 Whelen Modified Tour event on August 3, Doug Coby secured his first win of the season and his 11th of his career at the historic Stafford half-mile. The Call Before You Dig Late Model 50 event took place on Back 2 SKool Blitz Night. Paul Arute took down his first feature win of the 2018 season and the $1,811 purse. Kids were the big winners of the night as the midway was transformed to a Kids Zone with bounce houses, games of all kinds and a Wild Thing Kart prize wheel. In addition, kids entered the bike raffle presented by Big Haus USA Racing Products, DP Motorsports, Stafford Speedway, and Douillard Motorsports, with 4 bikes raffled. The Valenti Modified Racing Series made its final visit to Stafford Speedway on Friday, August 31 for the 9th Annual Lincoln Tech VMRS 80. Richard Savary took the lead on lap-26 and led the rest of the way to score his first career win at Stafford Speedway. Several racing milestones were reached during the 2018 season. Keith Rocco set a new SK Modified® record for consecutive feature wins with 6 in a row dating to the last 2 races of the 2017 season and the first 4 races of 2018. Tom Fearn set two new records in the Late Model division by winning 6 consecutive races from May 18 to June 15 and he surpassed Ryan Posocco for the most career Late Model wins with 48 wins and counting. Stay tuned for the release of the highly anticipated 2019 schedule.